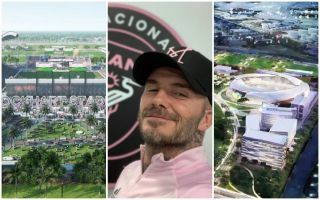 Inter Miami joint owner David Beckham seemingly has ambitious plans for the franchise, and they involve a huge investment on building two stadiums. The franchise is expected to launch in 12 months, but it appears as though they have a lot to do in preparation to ensure that they’re ready. As reported by The Sun, the plan is to initially knock down Lockhart Stadium and rebuild it to use as the club’s first base in an operation that is expected to cost around £50m. However, that will only be their temporary home for two years as they will then spend a further £750m on the Miami Freedom Park to open in 2022 which will be their permanent home while they turn the Lockhart site into a training centre and academy base. “From day one, six years ago, I said this project was all about the academy and the future of the kids,” Beckham is quoted as saying. It’s added that the plan is to build a 25,000-seater stadium as well as office space, a golf course and a hotel on the land around their permanent home in 2022. With that in mind, Beckham deserves a great deal of credit for investing time, money and passion into this project, as it sounds as though he’s intent on building the infrastructure to make this a long-term success and leave a lasting legacy on football in the US. Time will tell though if all goes to plan and if Inter Miami become a successful outfit on and off the pitch.